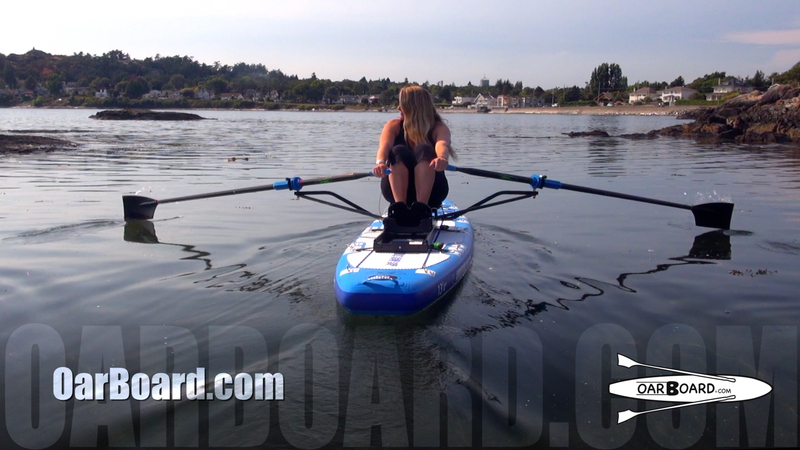 We created our two part carbon fibre oars to match the convenience of travel and storage of the oar board. Here we are going to break down everything that comes with them and how to put them together. Let’s start with the oar bag. 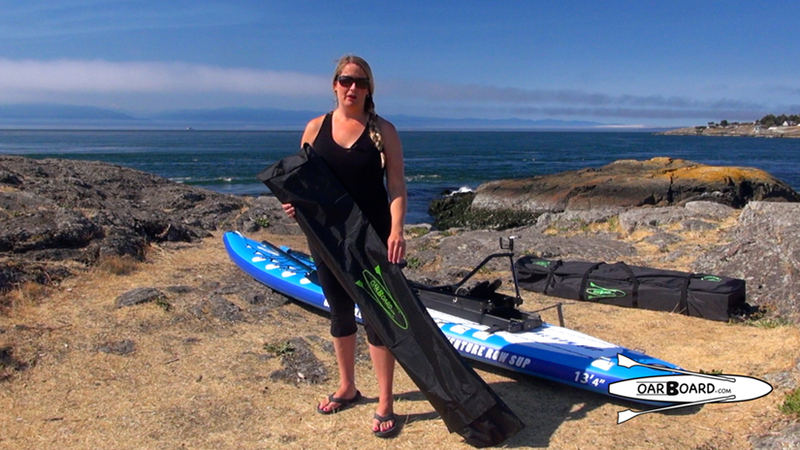 This now comes standard with any of the Oar Board® SUP Combos or can be purchased separately. 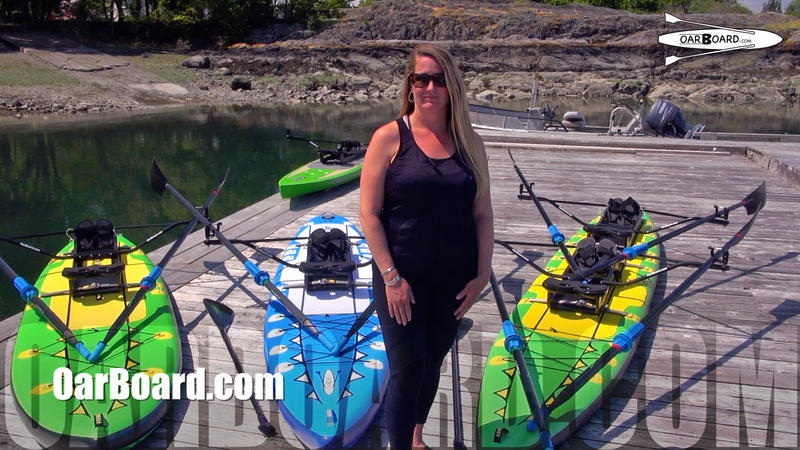 The bag is segmented into four sections which allows you to keep all portions of your oars together and organized for travel and storage. 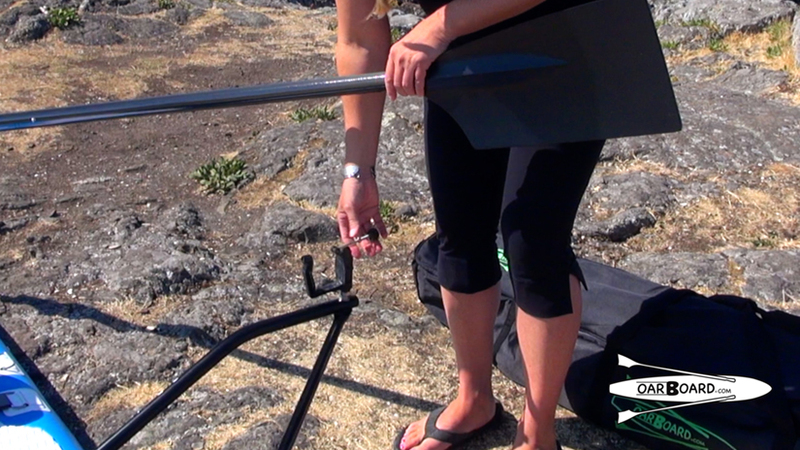 The oars come with collars and can be attached and adjusted with a flat head screwdriver. The collars only slip on one way so you can’t put them on the wrong way. Then you just need to place them at your desired setting before tightening the collar in place. 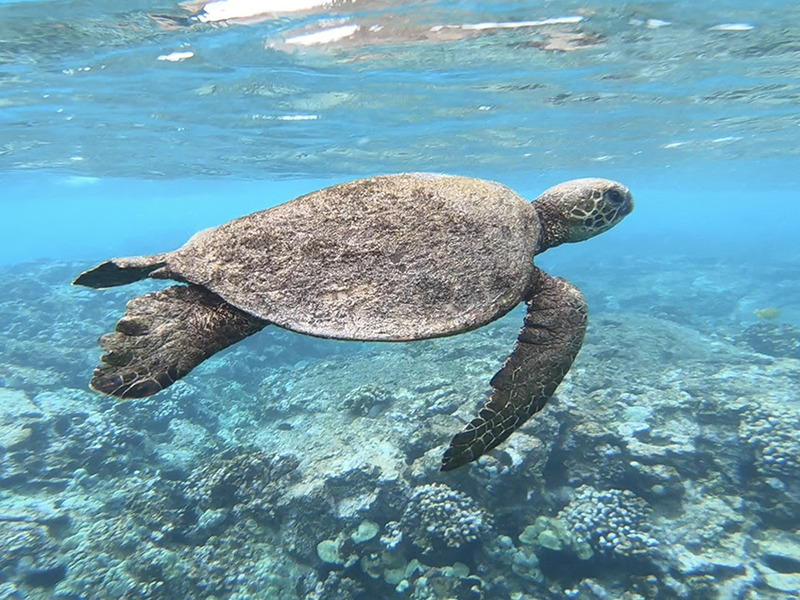 The higher the number you set your collars to, the more crossover you will have in your row stroke. Once the collars are on, you can leave them on as they will fit back in the bag still attached. Also included are a replacement set of spring clips. There are on hand in case you ever need to replace the ones that already come in place in your oars to keep them together. 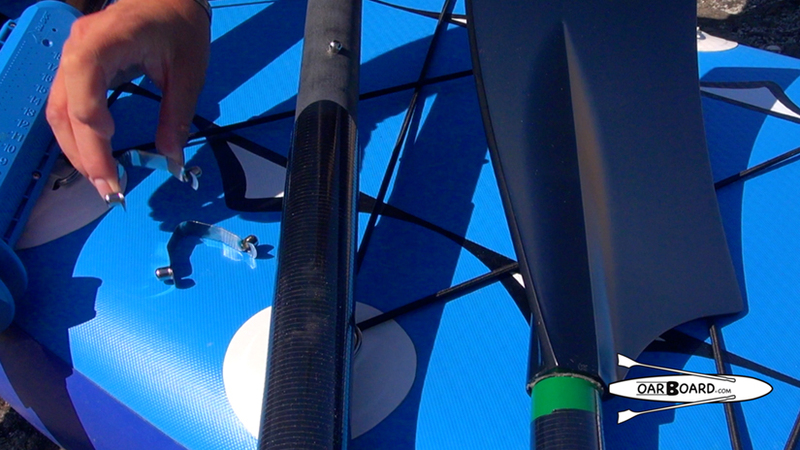 Once you have all of your pieces laid out in front of you, you will see all four pieces of the two part oars are marked with either a green or a red band so you can make sure you are putting them together correctly. To put them together, make sure you have both pieces of the same colour and slide the section with the blade overtop of the section with the handle and slide it down until you reach the clips. Then use your forefinger and thumb to push both buttons in together and slide the pieces together until the click into place. 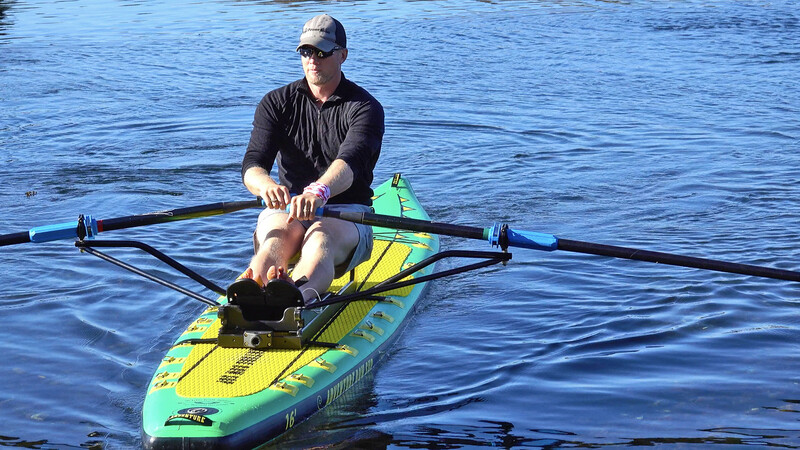 Once you have both oars put together and are ready to attach them to your Oar Board®, make sure you have your oar lock in the correct position. 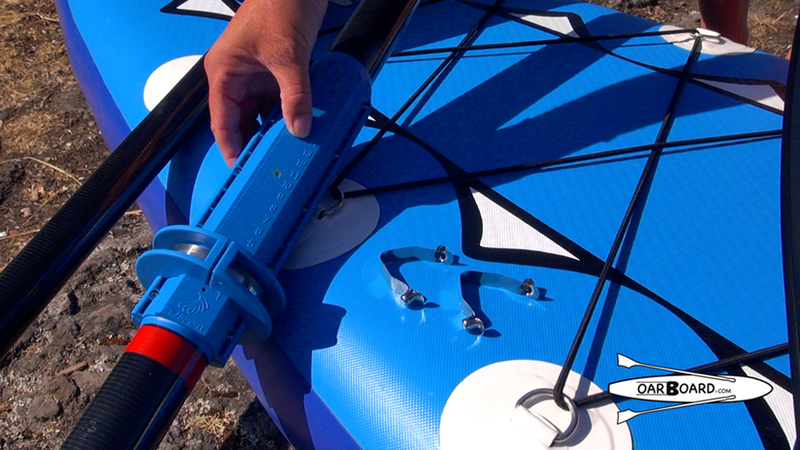 This is done by making sure that the oar lock is sitting parallel overtop of the strut. Make sure it is not hanging unsupported on the outside of the strut arm. 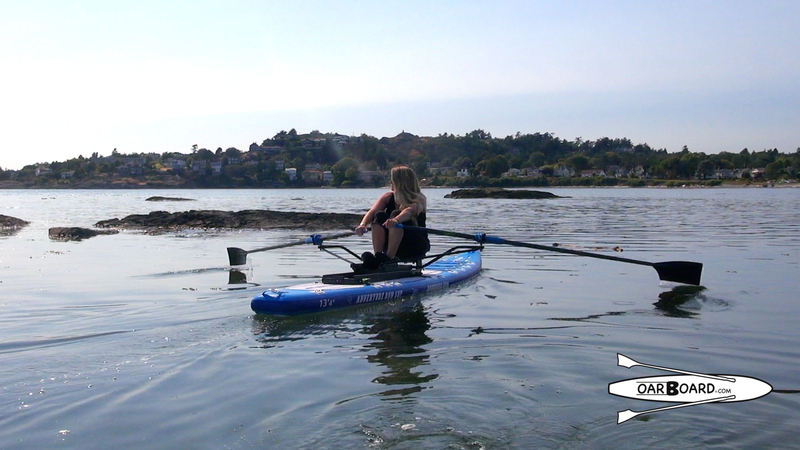 Then place your oar in the cradle, slide the bar into place and twist to tighten. 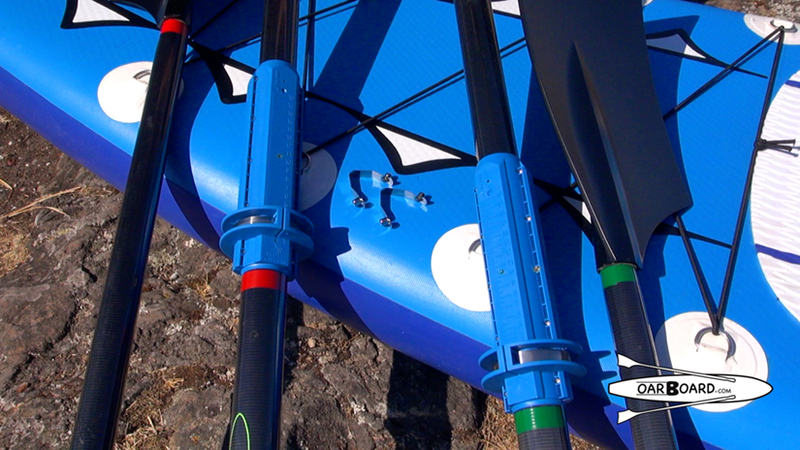 The red and green bands on the oars are designed to sit on the correct side of the board remembering that red is port and green in starboard based on the direction of travel, and not the direction you are facing. This means when you are seated on the Oar Board®, the port (red) oar will be on your right, and the starboard (green) oar will be on your left. 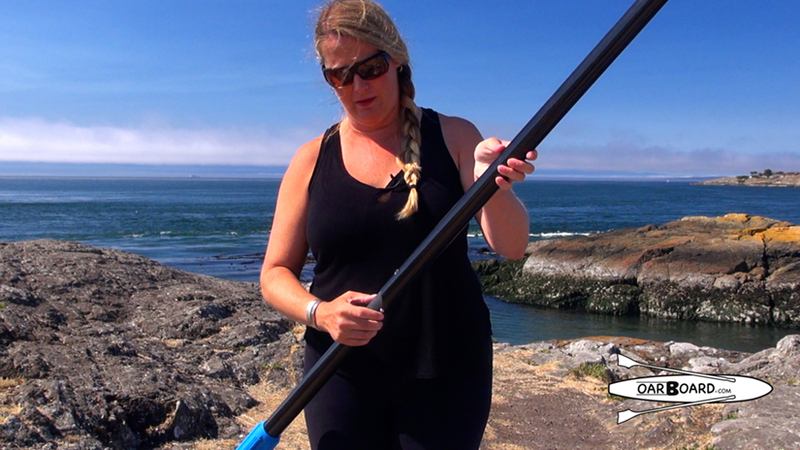 One easy way to tell if your oars are on the correct sides is just to glance at the oars and check that they are positioned so they will scoop the water when you take a stroke. 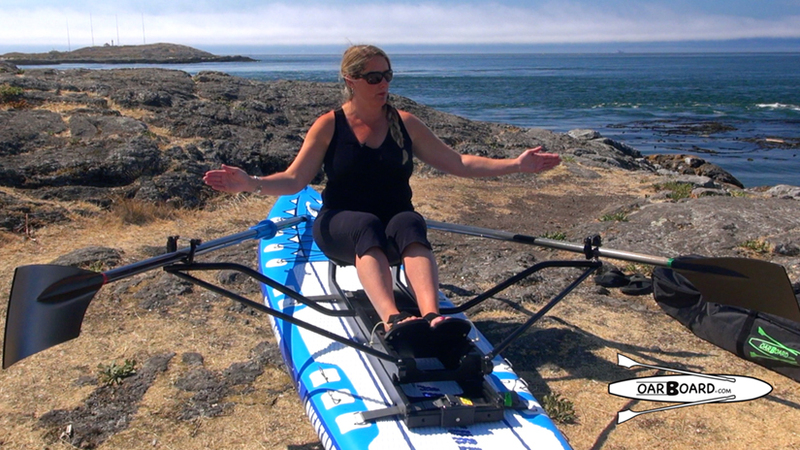 To take your oars apart, take your thumb and forefinger, pushing both buttons together and twist the oars apart. 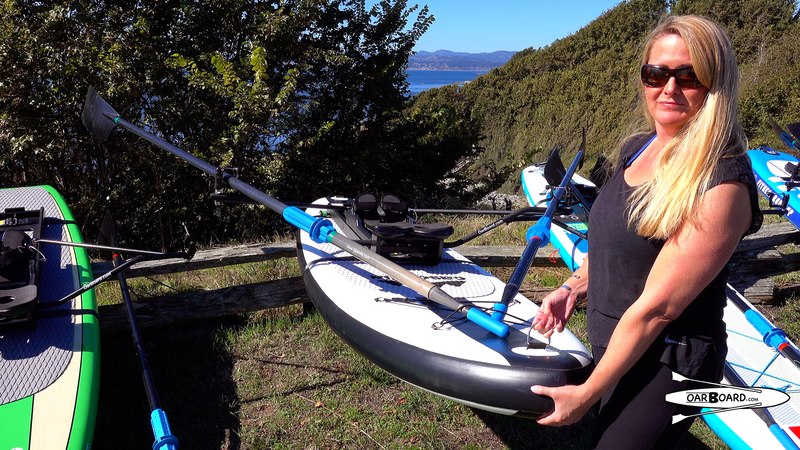 Remember to rinse off your oars, espessically if you have been in salt water, then they are ready to be packed away until your next time on the water!